Elisa Lam, her dead body at Cecil Hotel, unravels a morbid history bathed in murder and suicide. 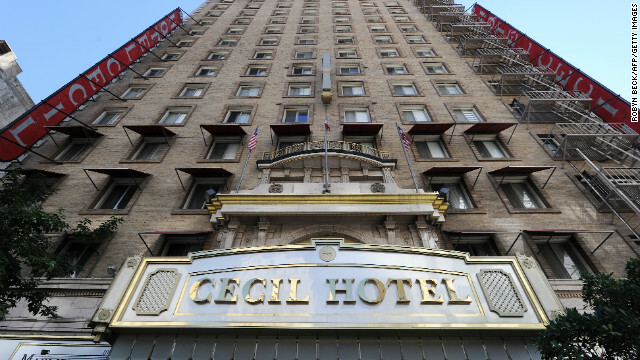 When 21 year old Elisa Lam’s body was found in a roof top cistern at the “Cecil Hotel” in downtown Los Angeles, a strange and morbid history of the building unfolded. But it was quickly upstaged by nicer hotels, in better areas and in the 1930’s became a place where people rented rooms long term, often, sharing bathrooms. In 2007, three floors were renovated back to hotel rooms, and one section is used as a hostel for European travelers. The remainder are long term rentals, or “SRO’s”. Part of its sordid history, involves two serial killers, Richard Ramirez and Jack Unterweger. There was also a murder of one of the residents. “Pigeon Goldie” Osgood, a retired telephone operator, known for protecting and feeding pigeons in a nearby park, was found dead in his ransacked room on June 4, 1964. He had been stabbed, strangled, and raped. The crime still remains unsolved. Frequent calls have been made to hotel management to ascertain if Ms. Lam was staying at the hotel, or in the hostel. They have not been returned. What caused her death is still unknown. 9 Responses to "Elisa Lam, Morbid History Of Two Serial Killers Unfolds At “Cecil Hotel”"
My brother recommended I may like this website. He was totally right. This publish actually made my day. You cann’t believe simply how so much time I had spent for this info! Thank you! I wonder if a hotel resident ingested some of the hotel water Elisa Elam’s body was decomposing in in the hotel water tank and spread the TB that way…eerie. Small correction/update: Richard Ramirez, the “Night Stalker”, died in June of this year. He’s no longer on death row. Just plain old dead. Yeah, there is an outbreak of a virile strain of TB that’s affecting the homeless in LA’s skid row right now. Soooo weird cause Lam Elisa is a TB test kit. Pigeon Goldie” Osgood was female, not male as your article states.